At CIMB Group we believe foresight is the key to unlocking potential. As we extend into universal banking to cover all areas of financial services, we look for individuals with a thirst for challenge, a sound educational background and outstanding capabilities. Well-rounded, multi disciplined persons with high intelligence, energy and integrity are welcome to be part of this forward thinking and fast moving organisation. Our accelerated expansion in recent years has transformed us into a universal bank with a global network. If you aspire to be part of a highly regarded organisation, where prospects are boundless, CIMB is the perfect partner to realise your dreams. CIMB is a fast growing universal bank, offering you a wide range of career opportunities. 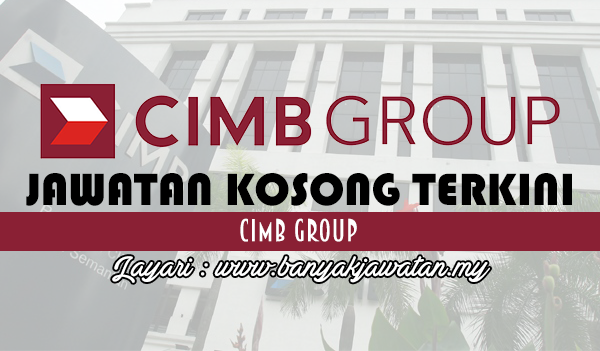 0 Response to "Jawatan Kosong di CIMB Group - 13 April 2017"